Will search engines index my data on your test store? 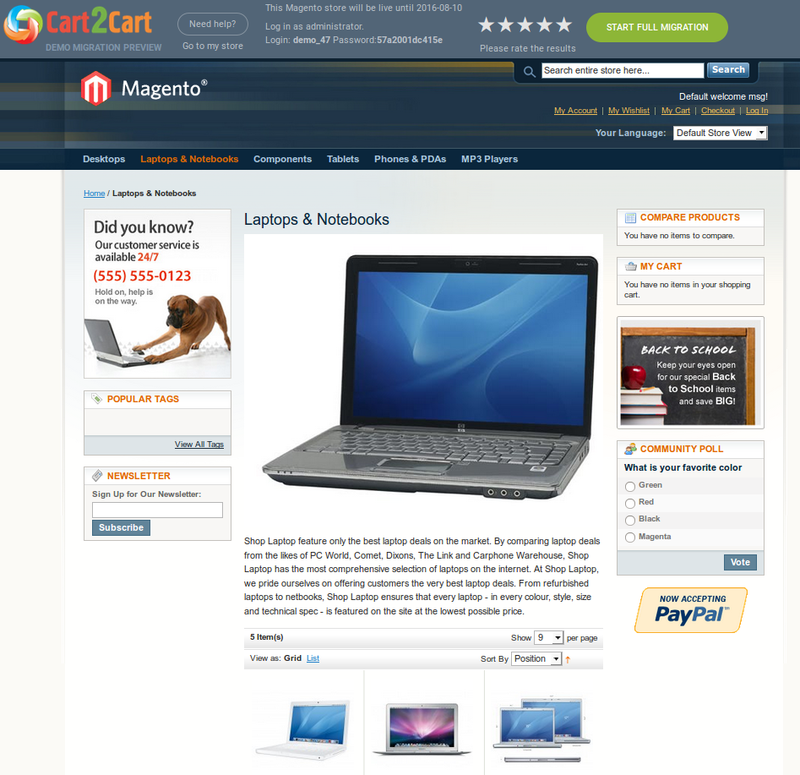 Cart2Cart temporary stores are located on our local servers and are fully closed for search engines. So, you don’t have to worry that Google will find your unique content in another directory. How long my test store will be available after migration? By default, Cart2Cart temporary store will be live for 3 days after Demo Migration. For this time you will be granted with administrator access credentials. Check the results from the front-end and back-end. At any time, you can go ahead to reconfigure your Target Cart info and perform Full Migration to an actual store. Please note: all your data will be cleared from the temporary store 3 days after Demo Migration is complete. Can I perform data migration without having Target Cart installed? You can easily perform migration with Cart2Cart even without having Target Cart installed. Migration Preview is an option that allows merchants to conduct data transfer for free to the latest Magento, VirtueMart, Woocommerce, PrestaShop, X-Cart 5 or OpenCart version. 1. Follow the Migration Wizard to provide details for your Source cart. Proceed next and select “Try migration using Cart2Cart test store” option. The following steps will be absolutely the same as in usual migration setup. 2. After Demo Migration is completed, you will get the link to your test store and administrator access credentials to the test shop. You will be able to check the results of data transfer on the front and back end. Administrator login details will be shown on a toolbar in a top of the page with your store. Note: The test store is closed for Google and other search engines, so don’t worry about your current web store rankings. 3. Cart2Cart test store will be live for 3 days after Demo Migration. 4. 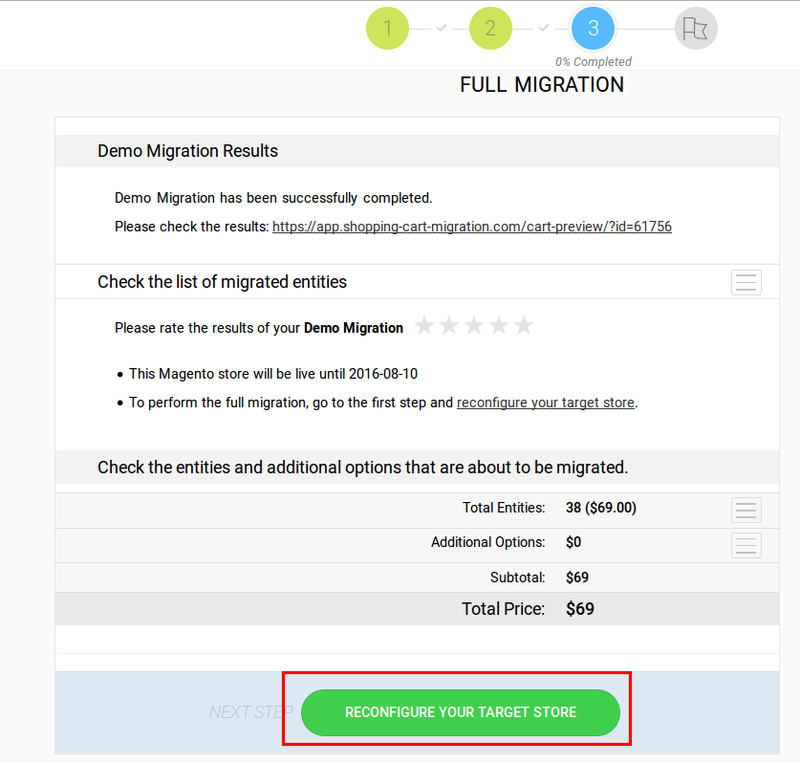 To perform Full migration, click “RECONFIGURE YOUR TARGET STORE” on the Demo Migration results page. You’ll be redirected to the first migration step where you should reconfigure your Target Cart info in accordance with an actual store and launch Full migration. How much Migration Preview option costs? Since Migration Preview option is offered within a Demo migration, it’s absolutely free. After finishing your Demo, you will be able to check the frontend as well as an admin area. Cart2Cart provides you with the administrator access credential for a temporary store. Being satisfied with the results, you’d be able to proceed with the Full migration by reconfiguring your Target Cart details and transfer your Source Cart data to a live store. Please Note: Cart2Cart Demo store will be live only for 3 days after performing Demo.